Meg Hitchcock's paper works are poignant meditations on language, religion and the mutability of the divine word. Hitchcock dissects holy texts, cuts them into letters, and rearranges them to speak the truths of another belief system. In a way, she is playing spiritual Scrabble. Last year, the artist broke down the text of the Koran into letters and rearranged them, gluing each letter to the gallery wall at Famous Accountants gallery in Brooklyn in order to re-create the entire New Testament's Book of Revelation. Through removing spaces and punctuation from the passages, Hitchcock suggests a flow to the language. In a review, Hyperallergic noted that the "pastiche draws attention to what all religions have in common -- using words as portals into a mystical and uplifting subjective experience." The process took Hitchcock 135 hours. Yet the intensive labor is part of Hitchcock's project, her devotion to her process becoming its own sort of spiritual ritual. The Brooklyn-based artist was initially raised as an evangelical Christian but now doesn't identify as religious, per se. However, her work ensures she is constantly engaged in sacred experiences from a range of influences. Hitchcock explains in her artist statement: "By bringing together the sacred writings of diverse traditions, I create a visual tapestry of inspired writings, all pointing beyond specifics to the universal need for connection with something greater than oneself." Her works depict the interconnectedness of all spiritual belief, as well as the adaptability of language. In a time when so many argue over the one correct interpretation of a text, Hitchcock shows the possibility of great multiplicity within each word. 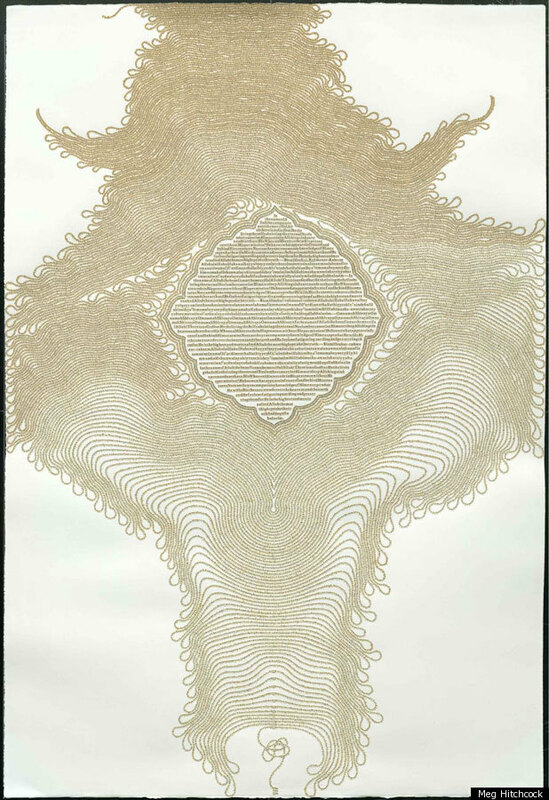 Meg Hitchcock, "The Satanic Verses": "Repentance" from the Koran; letters cut from "The Satanic Verses" by Salman Rushdie, 21" x 19", 2012, Courtesy of Timothy D. Woolsey.